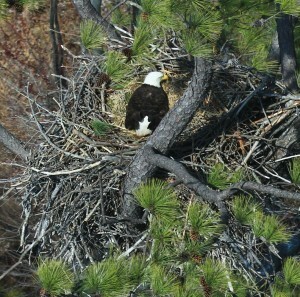 Bald Eagle incubating eggs on a nest in Northampton County, VA. Photo by Bryan Watts. Welcome to the VaEagles website. This site is focused on the bald eagle population that breeds in Virginia. The Center for Conservation Biology (CCB) has been the lead conservation organization working toward restoration and management of the bald eagle in Virginia. Working with a host of partners, CCB biologists have conducted dozens of research projects designed to answer questions that are vital to the long-term maintenance of eagles and their habitat within the Chesapeake Bay region. Since the late 1970s, Virginia’s breeding population has made a dramatic recovery from less than 30 to more than 730 breeding pairs. We hope that providing information to the public will help to raise awareness about and concern for this vulnerable population.